Our January 5th event was a great start to habitat restoration at Marymoor. Even though there were no plants to put in the ground -- well, okay, we found one straggler in a pot -- 27 volunteers came out for a total of 83.5 service hours. It was time well spent on mulching and invasive species removal. Also, a special guest from King County came to visit and there was even a little bird drama. During the morning, we focused work along the dog fence and in the meadow. The strip along the dog fence gets the most sun and was a top priority for mulching. Most of our volunteers worked on moving about nine cubic yards of mulch to cover approximately 400 plants. There were also a few brave souls who decided to take on the removal of some remaining blackberries near the bird loop kiosk. Then in the meadow we had a team of four who wielded weed wrenches (say that 3 times fast!) to take out hawthorn and scotch broom. Invasive species removal in the meadow is a time sensitive task because we need to be finished by the end of March before nesting birds arrive. 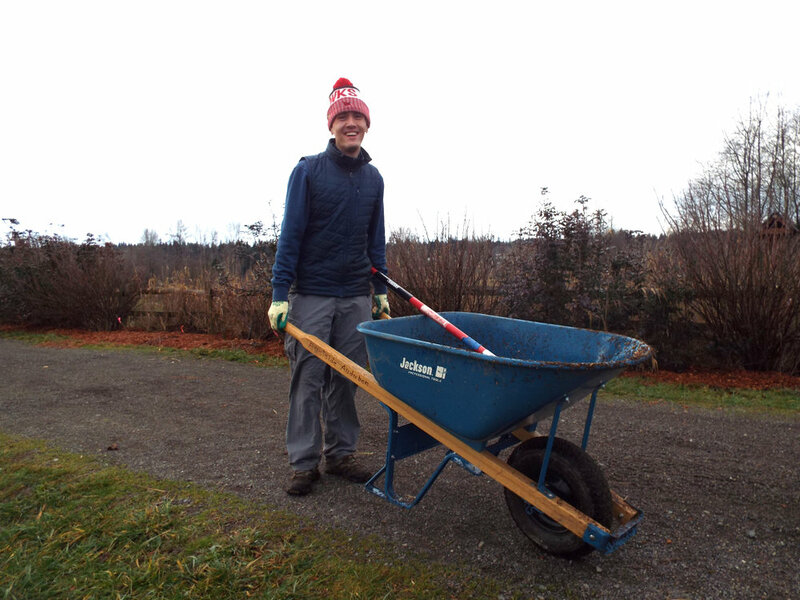 Our meadow volunteers were part of a larger group, the local chapter of the Verizon Wireless Green Team, who have been coming to many habitat restoration events at Marymoor. It’s been great to have them take on invasive species removal in the meadow these past few months. Our special guest this month was Lina Rose, Volunteer Program Coordinator for the Parks Department at the King County Department of Natural Resources and Parks. She is Eastside Audubon’s contact with the county, a volunteer resource, and provider of free parking passes and tools. She makes what we do possible. It was great to have her visit and see what we’re all about. We’re excited to work closely with Lina and the park to develop a vegetation management plan for the areas under Eastside Audubon stewardship and host some volunteer trainings on habitat restoration. Lastly, bird drama at Marymoor! There was a large flock of cackling geese that like to hang out on the play fields near Lot G, close to some of our habitat restoration areas. Midway through the restoration event, all of the cackling geese started making a ruckus and burst into flight, wheeling and circling in different directions. Who do you suppose caused the geese to stir? A raptor, of course! In this case, a bald eagle. The eagle headed towards Lake Sammamish, perhaps to catch a fish, and seemed rather unconcerned about the geese. All in all, it was a fun bird experience to share as we worked to make Marymoor a better place for our feathered friends and other wildlife.